Jiro Horikoshi (堀越 二郎, Horikoshi Jirō, 22 June 1903 – 11 January 1982) was the chief engineer of many Japanese fighter designs of World War II, including the Mitsubishi A6M Zero fighter. Jiro Horikoshi was born near the city of Fujioka, Gunma Prefecture, Japan, in 1903. 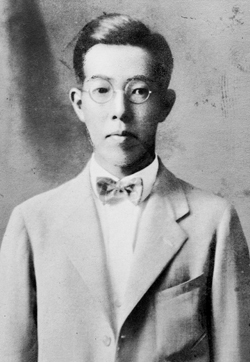 Horikoshi graduated from the newly established Aviation Laboratory (Kōkū Kenkyūjo) within the Engineering Department of the University of Tokyo, and started his career in Mitsubishi Internal Combustion Engine Company Limited, which later became Mitsubishi Heavy Industries, Nagoya Aircraft Manufacturing Plant. Jiro Horikoshi's first work was the flawed Mitsubishi 1MF10, an experimental aircraft that never passed the prototype stage after some flight tests. However, lessons learned from this design led to the development of the far more successful Mitsubishi A5M (Allied codename "Claude") which entered mass production in 1936. In 1937, Horikoshi and his team at Mitsubishi were asked to design Prototype 12 (corresponding to the 12th year of the Shōwa era). Prototype 12 was completed in July 1940, and it was accepted by the Imperial Japanese Navy. Since 1940 was the Japanese year 2600, the new fighter was named as "Model 00" or "Zero" or A6M Zero, in Japan also known as the "Rei-sen" (literally meaning "zero fight", shortened for Model zero fighter airplane). Subsequently, he was involved with designing many other fighters manufactured by Mitsubishi, including the Mitsubishi J2M Raiden (Thunderbolt) and the Mitsubishi A7M Reppu (Strong Gale). On 7 December 1944, a powerful earthquake in the Tokai region forced Mitsubishi to halt aircraft production at its plant in Ohimachi, Nagoya. An air raid made by B-29s on the Mitsubishi Engine Works in Daiko-cho, Nagoya a week later caused extensive damage to the works and a severe setback in production. 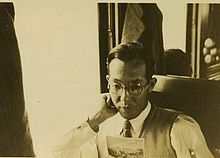 Horikoshi, who had been at a conference in Tokyo with Imperial Navy officers to discuss the new Reppu fighter, returned to Nagoya on the 17th, in time to experience another air raid on the Mitsubishi factories the next day. As a result of the air raid, the company evacuated its machinery and engineers to the suburbs of eastern Nagoya. Horikoshi and the Engineering Department were rehoused in a school building which had been requisitioned. After the war, Horikoshi participated in the design of the YS-11 with Hidemasa Kimura. He subsequently left Mitsubishi and taught at educational and research institutions. From 1963 to 1965, he was a lecturer at the University of Tokyo's Institute of Space and Aeronautics, and was subsequently a professor at the National Defense Academy from 1965 to 1969. Between 1972 and 1973, he was a professor of the Faculty of Engineering of Nihon University. In 1956, Horikoshi collaborated on a book about the Zero with Okumiya Masatake, a general in the JASDF and a former Imperial Navy commander who had led Zero fighter squadrons during the war. The book was published in the US in 1956 as Zero: The Story of Japan's Air War in the Pacific. In semi-retirement by the early 1970s, he served as an advisor to the society of Japanese aircraft constructors, and continued to receive letters from aircraft enthusiasts around the world. On a trip to New York, he travelled to Long Island and stayed in the Garden City Hotel, where Charles Lindbergh had spent the night before his solo trans-Atlantic flight in 1927. In the 1973 autumn honours list, Horikoshi was awarded the Order of the Rising Sun, Third Class, for his achievements. His memoir regarding the development of the Zero was published in Japan in 1970, and was translated by the University of Washington Press as Eagles of Mitsubishi: The Story of the Zero Fighter, which was published in English in 1981. Horikoshi died of pneumonia in a Tokyo hospital on 11 January 1982, aged 78. His obituary was covered in several major newspapers around the world. He was posthumously promoted to the fourth rank in the order of precedence. He was survived by five children, none of whom pursued a career in aircraft design or engineering. Horikoshi is the subject of The Wind Rises, a fictionalized biographical animated film by Hayao Miyazaki, released in 2013, in which his voice was provided by Hideaki Anno (and Joseph Gordon-Levitt in the English dub). In particular, although the film follows the progression of his aircraft designs, the details of his personal life are mostly fictitious (for example, he had an older brother, not a younger sister). [better source needed] These additional plot elements were adapted by Miyazaki from Hori Tatsuo's 1937 novel The Wind Has Risen. ^ Odagiri, Hiroyuki (1996). Technology and Industrial Development in Japan. Oxford, UK: Clarendon Press. p. 215. ISBN 0-19-828802-6. ^ a b c d e Okumiya, Masatake; Horikoshi, Jiro (1956). Zero! The Story of Japan's Air War in the Pacific. New York: EP Dutton & Co. ISBN 0-74344-491-4. ^ a b Penberthy, Jeff (December 14, 1972). "Plane Designer Recalls Days of Zero's Success". The Los Angeles Times. ^ "Jiro Horikoshi, 78, Dies in Tokyo; Designer of Zero Fighter Aircraft". The New York Times. January 12, 1982. ^ Associated Press (January 12, 1982). "Jiro Horikoshi, 78, Dies in Tokyo; Designer of Zero Fighter Aircraft". The New York Times. ^ Cangialosi, Jason. "Miyazaki's 'The Wind Rises' Ignites Debate & Japanese Box-Office". Yahoo! Voices. Archived from the original on 27 July 2014. Retrieved 15 August 2013. Horikoshi, Jiro (1992). Eagles of Mitsubishi: The Story of the Zero Fighter. Trans. by Shojiro Shindo and Harold N. Wantiez. Washington, DC: University of Washington Press. ISBN 978-0-295-97168-1. OCLC 28334804.